If ever there was a French specialty in the car market, it's this particular construct of hot hatchback: a taut, track-ready sort with a squat comportment and naturally aspirated four that pulls like a mid-80s Mustang GT. Renault's unveiled yet another version of its rapidly expanding Clio RS line; this one based on its damped-and-tamped Cup chassis. The 'World Series by Renault' Clio Renault Sport Edition small hatchback was officially presented to the public last weekend at France's Magny-Cours track. It's got a 200-horsepower 16-valve four displacing two liters, linked to a TL4 six-speed box — both products of the Renault-Nissan alliance. Top speed is a sprightly 138 miles per hour. Look for it now in a UK forecourt near you. To coincide with the World Series by Renault meeting at France's Magny-Cours racetrack which took place the last weekend, Renault Sport Technologies presented the "World Series by Renault" Clio Renault Sport, a unique celebration of this increasingly popular top-class motor sports event. This exceptional car emphasizes pure performance and motoring passion, combining highly distinctive looks with true sports performance, largely thanks to Cup chassis and thanks to a new gearbox staging, which will be appearing across the Clio Renault Sport range from October. 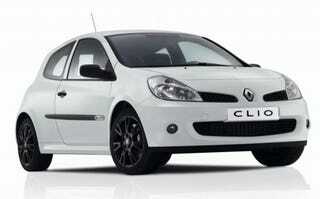 In France, the "World Series by Renault" Clio Renault Sport is priced at €21,900. Order books open across the Renault dealer network in week 39 for the UK and in week 43 for France, Spain and Italy. Under a motor sports concept unique in Europe, World Series by Renault events have drawn a total audience of 1,500,000 since the first meeting was held in 2005. The events combine a quality sports programme with other features appealing to a broader public than motor sports fans alone. To coincide with the World Series by Renault event at the Magny-Cours racetrack which took place the last weekend, Renault Sport Technologies presented the "World Series by Renault" Clio Renault Sport. This signature edition features a highly distinctive appearance, with black satin-finish wheels, dark anthracite hubcaps, and special "World Series By Renault" décor. In France and United Kingdom, the "World Series by Renault" Clio Renault Sport benefits from the Cup chassis and Dark Anthracite black satin-finish wheels combine to improve handling feel and precision. With a stance slung 7mm lower than Clio Renault Sport, it boasts a lower centre of gravity which reduces load transfer, so offering more effective cornering (with circuit time gains of 0.2s per kilometre). Its cornering power on the flat is further enhanced by damper setups and increased spring stiffness (+27% at the front, +30% at rear) for higher performance and extreme pleasure. With a 10% increase in bending stiffness and more flexible bump stops, the double-axis strut system derived directly from Clio Renault Sport expresses its full potential.